Why accuracy and details is crucial in working drawings? In the plainest terms, working drawings are a representation of the actual structure. These drawings are the exact reflection of what the structure will be ‘accurately’ constructed as. In the last few years, technological advances have been made in many aspects of construction. We have witnessed technology and its benefits taking the design and documentation process to the next level. Today, both residential and commercial construction projects are drowning in complexities. There are many more ‘modern’ elements that have been added to the design and drawings. However, there is still an incessant need for projects to be completed in a shorter span of time and in the most cost-effective forms. The only way the AEC industry has managed to deliver the construction projects in stipulated time along with with the application of the most minimum costs is because of the ‘intelligent’ and ‘accurate’ blueprints/CD sets created by the architects and designers. BluEntCAD’s expert team have highlighted why accurate and meticulously detailed drawings are extremely significant to carry out exceptionally successful residential and construction projects. They have discussed 3 core benefits of the two factors. If we go back to the time when stakeholders were completely dependent on hand drawings, AEC industry sure has many horror stories to reveal. There was a time when clients and at times even the construction firms would have to shell our large amount of money to remake or redo the smallest part of the already constructed building. Before the construction workers could reach the next phase of the structure, clients would want changes in the design. There was yet another scenario, due to some minor error in the design workers would need to modify the structure to fit the correct one in. This led to heavy expenses and construction would be a very complicated and expensive affair. However, with 3D computerized drawings every tiny detail is recorded and it is exhaustingly accurate. These working drawings are so real that clients know exactly what to expect. Hence even before the actual construction begins the required modifications are dealt with. Accurate and detailed measurement is the most fundamental element on which the entire structure stands. The CD sets also include elements such as electrical, plumbing, mechanical and structural components. The working drawings are made up of these quantified dimensions. This doesn’t only include the rooms and walls but today the 3D models of the structure is a complete set of proportions and dimensions which also include every tiny component from cabinets to the fixtures to the appliances door, window etc. It does not stop there. It also incorporates the heights, bearing heights, beam heights, sizes and plate of these outlets such as door/window in every corner of the space. Then, measuring the roof pitches, ceilings, slopes in floors etc. is also extremely crucial The 3D model is the exact structure of what is going to be built on the property. All the elements mentioned above need to fit and complement each other – if even one is incorrectly measured or missing it changes the entire construction process. All in all, the importance of accuracy and exhaustively detailed drawings goes beyond the bucket list of benefits. It is what makes the construction process today very streamlined, smooth and quicker. It keeps all the phases of a project economical and efficient. It avoids all kinds of misunderstandings between the stakeholders ensuring that there is an easier and more seamless transition from one phase of the construction process to the other. 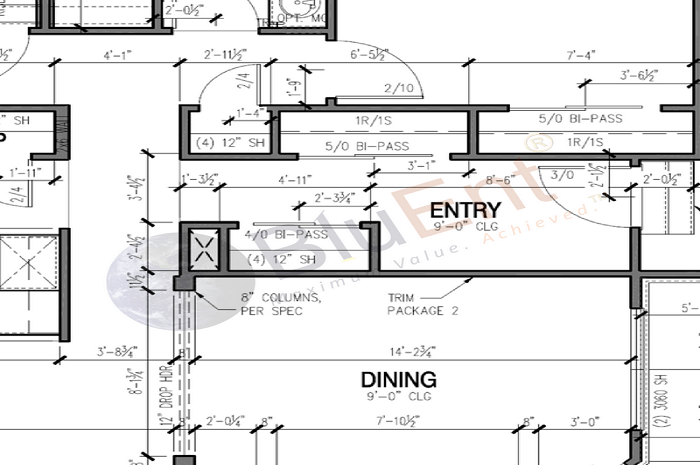 At BluEntCAD we believe the most intelligent choice is to invest a good amount of time in creating the construction blueprints and ensuring that we develop an accurate set of detailed drawings. The precision and planning that our team puts into every construction project assures that it is micro-managed with an overall time/cost savings. Talk to us about your upcoming project and get to know more about our services.